I have been making these delicious bread rolls for years with a range of different fillings. 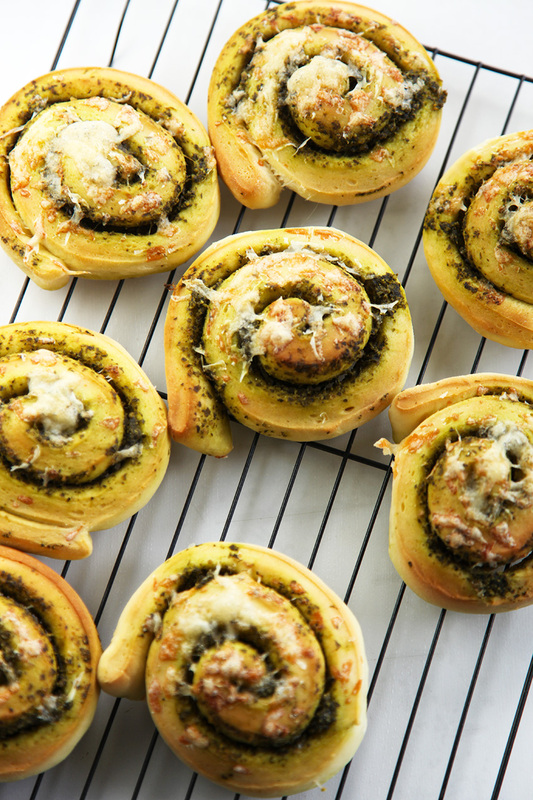 This kale pesto filling is really delicious as the lemony flavour is balanced beautifully by the sweet bread. If you want a short cut, store-bought pesto would also work well. Heat water, milk and butter in a saucepan over low heat until the butter is melted. Add to a mixing bowl and allow to cool to lukewarm. Add honey and 1 1/2 cups of flour and lightly whisk until smooth. Add the eggs and yeast and stir until smooth. Allow to sit uncovered for 15 minutes. Mix in salt and another 1 1/2 cups of flour. Knead the dough adding the extra cup of flour until it no longer sticks. (I used a kitchen aid and dough hook but it works just as well kneading by hand). Add dough to a lightly greased bowl and cover with plastic wrap. Allow to double in size - about an hour. 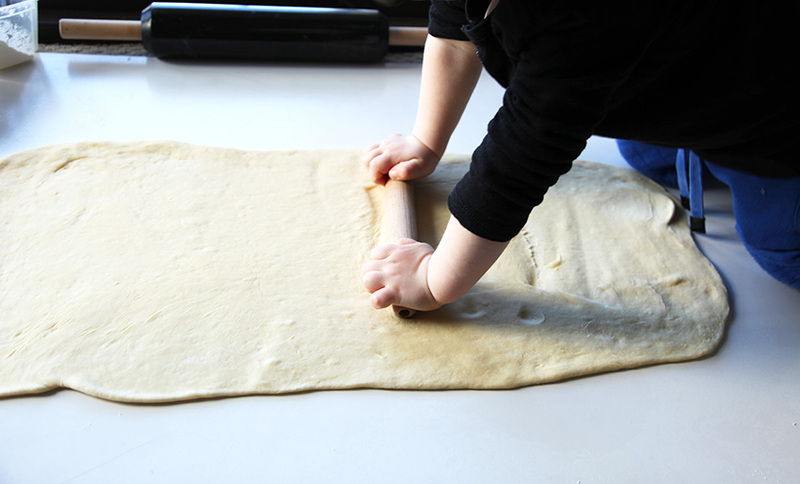 Punch down the dough and roll out to an approx 12x 24 inch rectangle. 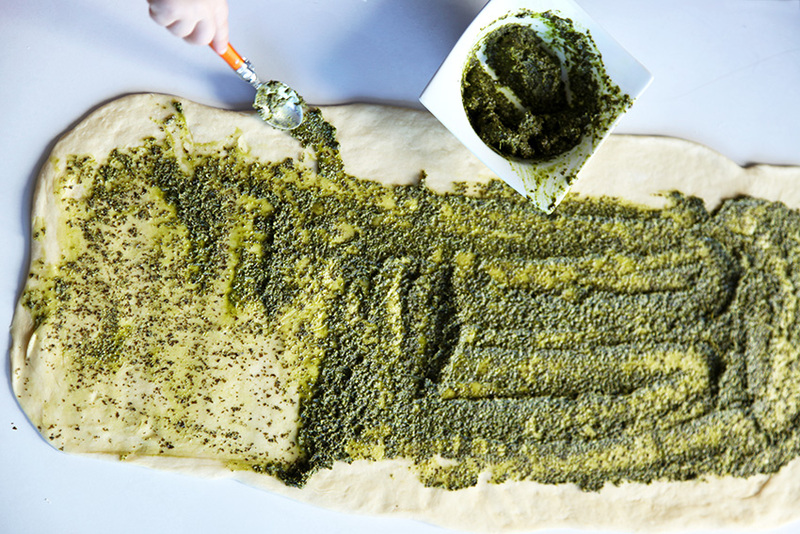 Spread a good amount of the pesto over the bread, leaving a 1/2 inch around the edges. Fold over the long edge and roll and secure the seam with a little water. Using a sharp knife cut into about 20 portions. Add to baking paper, cover in plastic wrap or a tea towel to rise again for about an hour. Pre-heat oven to 180 degrees C (350 degrees F). Once risen, sprinkle with extra parmesan and bake for 15-20 minutes or until golden. Allow to cool slightly and serve. Remove stalks from the kale. Blanch kale in boiling water until it is wilted. Refresh under cold water. Squeeze out excess liquid and add to a food processor with the remaining ingredients and pulse until the desired consistency is reached. The recipe make more pesto than is required. Freeze what remains and add to pasta for an easy dinner. I like to blanch the kale but it is fine to use completely raw if you prefer. These look great, have you made them with wholemeal spelt? Does that give you the same consistency? This is such a clever way to hide greens! I’m definitely going to try this!!. They look amazing…. and delicious! Are they savory-ish? And the little hands are too cute. Thanks very much. Yes they are savoury. The bread is slightly sweet but balanced nicely with the lemony pesto. These look great!! 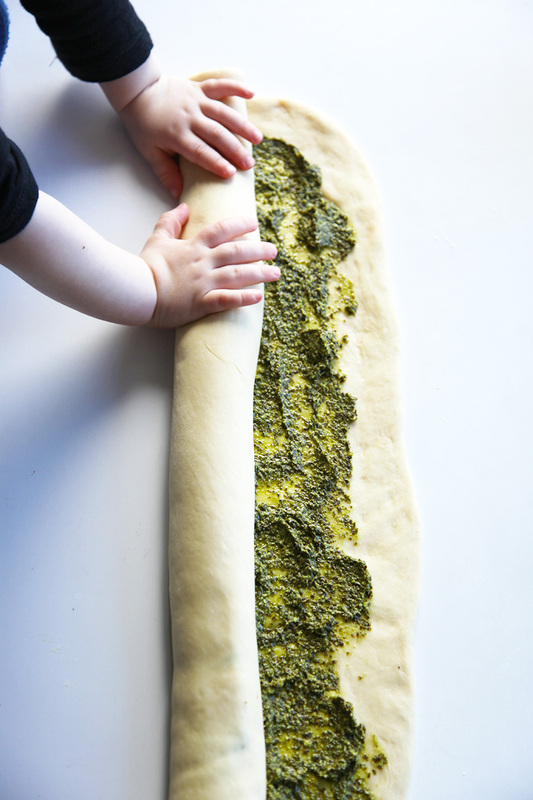 I love making bread rolls, but I’ve never had a pesto filling, will have to try it! What a great appetizer or addition to a great pasta dinner instead of garlic bread. Thanks Gloria, that’s a great idea. They are pretty flexible with regards to filling, so you could add whatever suits. Mmmm now THIS is a way to eat kale! Thank very much Steph, its also a great way to sneak a few extra veggies in if you have fussy eaters. Hi Cristie! This is Krystallia (from food bloggers central) & I nominated you for the LIEBSTER AWARD! I strongly believe that your blog is amazing with interesting recipes and I really like it. To find out more information and how to get started with this award… read the following post on my blog http://www.mycookingsecrets.com/the-liebster-award/ Enjoy the rest of the weekend. I love this idea! And adding the kale is such a great way to add greens! I think my kids would enjoy making and eating these! What a clever way to get your kids to eat their kale. Looks delicious! Baked bread scrolls/rolls are the BEST! Loving the ‘little hands’ shots. 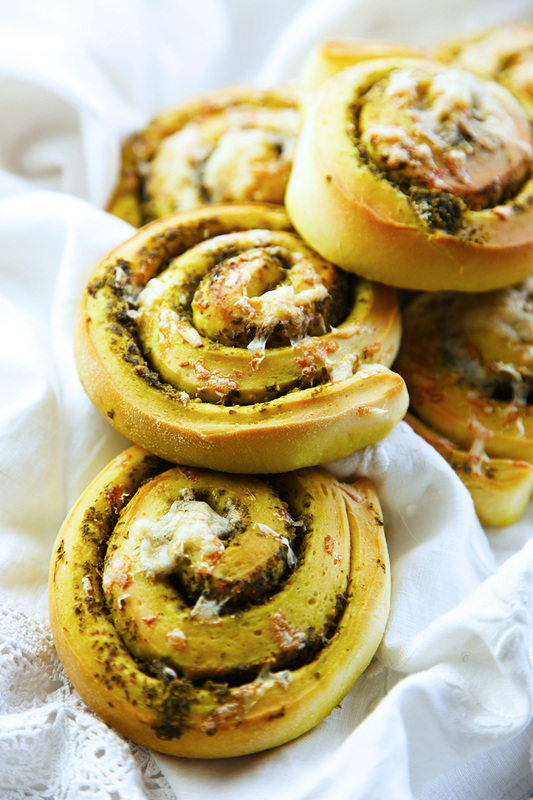 The entire batch would go in a jiffy if kept in my house, we love pesto breads and these rolls are making us DROOOOOOOL ! I love these photos, they are so special, it reminds me of when I am cooking/baking with my daughter and she gets involved. The rolls looks so great too! Love all your ideas! Thanks Sara, it’s so nice to capture those little moments. Hopefully the blog is still around when my little guy is older and he can browse through the photos. They just love to help out and its great for them.